Greetings from the IPSI Secretariat in Tokyo, Japan. IPSI and its members continue to stay active in a wide variety of projects and activities related to maintaining and revitalizing socio-ecological production landscapes and seascapes (SEPLS). We are looking forward to taking part in CBD COP 14 later this month and meeting many of our partners there. In addition to details about COP, this month’s newsletter also contains an announcement of the publication of the latest volume of the “Satoyama Initiative Thematic Review”, and a call for proposals for grants in the Madagascar and the Indian Ocean Islands biodiversity hotspot. We are also very pleased to share a profile of our newest members, Fundación Semillas de Vida A.C., and a recent IPSI case study on eco-friendly farming from Universidade Federal da Fronteira Sul (UFFS). The Fourteenth Meeting of the Conference of the Parties to the Convention on Biological Diversity (CBD COP 14) will be held from 17-29 November 2018 in Sharm El-Sheikh, Egypt. The COP meeting is the major biennial event of the governing body of the CBD, and the IPSI Secretariat looks forward to taking part in the meeting and collaborating with many IPSI members and friends. We will also have a display booth in the CEPA Fair section, and will take part in other events held concurrently with the COP meeting. This will be a great opportunity to disseminate the outcomes of the recent IPSI-7 Global Conference, as IPSI committed to do in the “Ishikawa Statement 2018“, an outcome of IPSI-7. We are sure that many readers will be attending and holding activities at CBD COP 14. Please contact the IPSI Secretariat and let us know about your plans, so that we as a partnership can make the most of this major event and work toward mainstreaming the concepts of the Satoyama Initiative in important international policymaking processes. We look forward to seeing many of you there. For more information on CBD COP 14, see the official event page on the CBD website here. 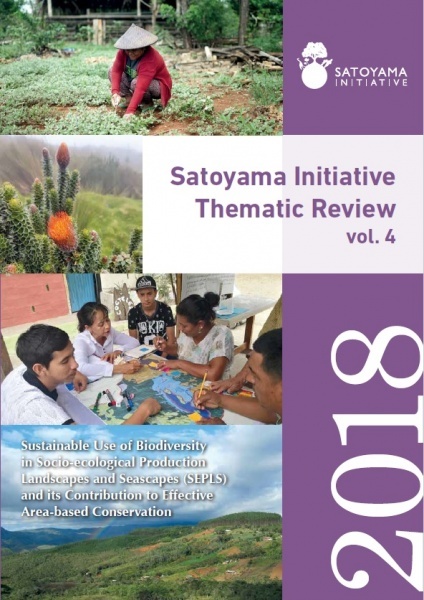 A new volume of the Satoyama Initiative Thematic Review (vol. 4) with the theme: “Sustainable Use of Biodiversity in Socio-ecological Production Landscapes and Seascapes and its Contribution to Effective Area-based Conservation” was recently published jointly by UNU-IAS and IGES. The volume compiles 9 selected case studies provided by authors belonging to IPSI member organizations and covers experiences from countries all over the world, with various socio-political and ecosystem contexts. Authors were asked to identify how to ensure sustainable management and use of biodiversity in SEPLS and their contribution to effective area-based conservation, and how effective area-based conservation contributes to the goals of the global conservation agenda. This topic is closely related to IPSI’s ongoing work related to SEPLS contributions to Aichi Biodiversity Target 11, which concerns “protected areas and other effective area-based conservation measures”. In addition, the volume includes a synthesis chapter that summarizes the findings of the case studies and provides overarching principles for policy makers and practitioners working on the ground. The publication will provide useful knowledge and lessons for a broad audience including policymakers, practitioners and academics working on issues related to SEPLS and interested in their wide-scale application and policy incorporation. The electronic version is available for download here. IPSI member the Critical Ecosystems Partnership Fund (CEPF) is currently soliciting letters of inquiry (LoI) from non-government organizations, community groups, private companies and other civil society organizations, for large grants in several countries in the Madagascar and Indian Ocean Islands Biodiversity Hotspot, including Madagascar, Mauritius (including Rodrigues), Seychelles and Comoros. IPSI members in this region are encouraged to consider applying for these grants if they are relevant. Please see the call for proposals on the CEPF website here. New Member Introduction: Fundación Semillas de Vida A.C.
Fundación Semillas de Vida A.C was created in Mexico in 2007 with the mission and vision focused on Mexican small-scale agriculture. The organization operates through empowering small-scale farmers and developing agrobiodiversity, concentrating especially on the native maize production by identification, conservation and participant improvement of native seeds. Parting from the seeds and all the way to the table, the primary goal is to create access to healthy sustainable food, and this through supporting small-scale Mexican farmers since they are the creators and developers of the vast agrobiodiversity in the country. In 2006 a Civil Society Organization was started, composed by citizens convinced of the importance food has for health, and consequently interested in how our food is produced. They concentrate especially on native maize production through characterization, conservation and participant improvement of the seeds. The big maize cobs that we are familiar with today have been developed during the last 10 000 years by Mesoamerican farmers within the “Milpa”. 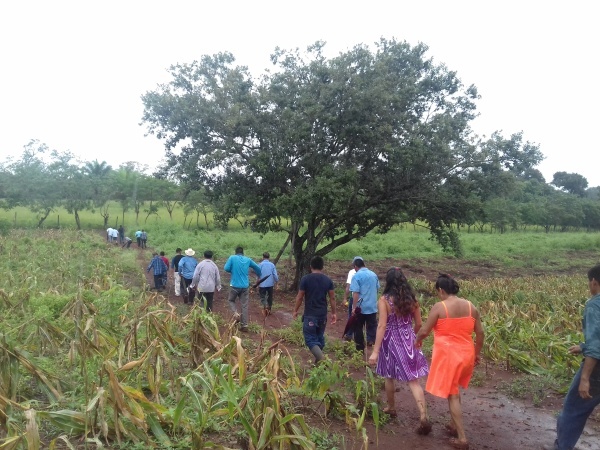 The Milpa is a socio-ecological production landscape which is an example of harmonious human-nature interaction in a complex organization of different plants interacting and growing together, in this way creating its own ecological system. One main strategy when working in the field is to work together with the farmers through workshops and knowledge dialogue, while working to spread knowledge among consumers of modern food risks and the benefits of sustainable agriculture and healthy food. For more information, please see the Fundación Semillas de Vida website here. The IPSI Secretariat recently received a case study from partner organization Universidade Federal da Fronteira Sul (UFFS) in Brazil, titled “Fish farming in Rio das Cobras Indigenous Land, State of Paraná, Brazil”. UFFS is a public institution in the South of Brazil founded in 2010 with most activities focused on regional sustainable development. It is located within an agricultural region characterized by small family farms and low development indexes. A large reserve is located within this region, Rio das Cobras Indigenous Land, occupied by the Kaingang and the Guarani Mbya ethnic groups. This project on fish farming started in 2014 as an initiative from lectures in the courses of Bachelor in Aquaculture Engineering and the Master program in Agroecology and Sustainable Rural Development and it was funded by the Brazilian Ministry of Education. The fish farming project initiated as a consequence of the demand from the local community. Fish is an important part of Rio das Cobras Indigenous Land´s food habits. Most of the fish consumed by these communities come from fishing, however catches have decreased rapidly due to water pollution. In this case, fish farming can be an important source as fish growth in ponds can be managed and controlled.